Trace out my pattern or take yourself out for a coffee and trace out the coffee collar you get at your local coffeeshop. If you do this method, be sure to add an extra ¼ to ½ inch around the outside to allow for your seams. (I used ½ inch just because it was easier to trace.) Cut one of your outside fabric and one of your inside. Cut a 2 ½ inch piece of thin elastic OR if you have some extra hair bands, you can cut one in half and use it instead. Step 2: Arrange your pieces and sew! Stack your fabrics right sides together. Tuck your piece of elastic in the middle of one of the short sides. The loop of the elastic should face into the fabric and the raw edges should line up with the raw edges of your fabric. Pin the elastic in place. With a ¼ inch seam allowance, sew around the outside edge. Leave a two-inch gap to turn your project right sides out. If needed, take a minute to trim up any edges that aren't even to each other. Your elastic loop should be sticking out of one side. Use the end of a pen to push out the edges of your fabric, particularly in the corners. Be sure to neatly press the edges of your gap so that they’re folded in and will be sewn under with your finishing edge. my gap. see how neatly if folded it in? Sew a border around the edge of your fabric about ¼ to ½ inch in to give it a finished look and secure the edges. Check where your gap was to make sure that both raw edges are sewn under. If not, give it one more quick seam between your finishing edge and the outside. It shouldn’t be too noticeable. all pressed and ready to be sewn! 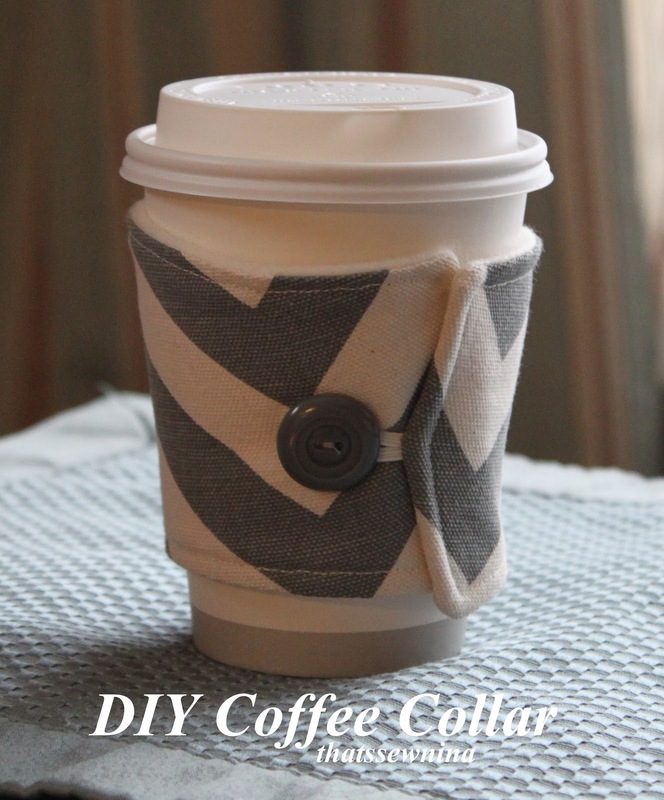 Wrap your coffee collar around a standard mug or your coffee cup from earlier if you still have it. Stretch your elastic a bit and mark where your button should be. Stitch your button in place. Timeclock: This little guy only took me 23 minutes!